The Mitel 6873 is a VoIP phone that features a 24 line SIP LCD display. It provides a large 7” touchscreen display with high speed networks through dual Gigabit Ethernet ports with embedded Bluetooth and a powered USB port for headsets. It offers a remarkable HD wideband audio, an enhanced speakerphone and advanced audio processing that deliver crystal clear hands free conversations. The Mitel 6873 has many exciting features for users of all types. You can extend the lifetime of your Mitel 6873 with the purchase of a FactoryOutletStore Factory Protection Plan. 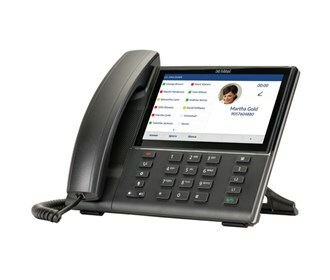 See the Mitel 6873 gallery images above for more product views. The Mitel 6873 is sold as a Brand New Unopened Item.